Matt writes stories when not killing time as a mechanic. 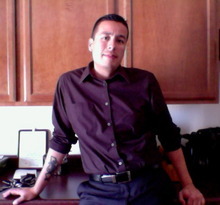 He lives in Tucson, AZ but is originally from Chuco. Sherman Alexie, Sandra Cisneros, Gabriel Garcia Marquez, Octavio Paz, Roberto Bolaño, Juan Felipe Herrera, Junot Díaz, Manuel Muñoz, Sam Quinones, Sherwin Bitsui, James Baldwin, Zora Neal Hurston, Alex Haley, Edwidge Danticat, Jason Brown, F.X. Toole, Cormac McCarthy, Philip Roth, Aurelie Sheehan, Grace Paley, Eudora Welty, Rachel Yoder, Cara Adams, and many others. Matt, so nice of you to comment on my story Little Peebles, and welcome to F'naut! Thanks Matt for finding my story. I appreciate the read and comments very much! Thanks for the words on Hot. Thanks for the comments on my story. You must log in to write on Matt Mendez's wall.